(Bismarck, N.D.) –Sanford Health is proud to announce plans to open a new children’s clinic in north Bismarck to provide more convenient access for families and to meet the community’s growing need for health care services. 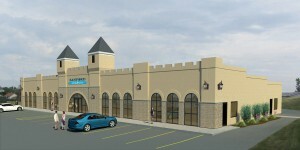 Expected to open in late spring 2013, the 9,000 square-foot clinic will look like a castle and feature a child-friendly environment. The clinic will also be another home for Meddy Bear, and will supplement the children’s services currently provided at Sanford Health’s downtown campus. Sanford Children’s Castles of Care are vibrant, colorful places where sick and injured children find inspiration, imagination and play to help them heal along with the treatment they receive from their pediatrician or nurse practitioner. This initiative is part of Sanford Health’s ongoing work to meet the growing health care demands of the region, caused in part by the Bakken oil boom in western North Dakota. This new Sanford Children’s Clinic will be located at 765 W. Interstate Ave., west of Pinehurst Veterinary Hospital. Sanford Health is an integrated health system headquartered in the Dakotas and is now the largest, rural, not-for-profit health care system in the nation with locations in 126 communities in eight states. In addition, Sanford Health is in the process of developing international clinics in Ireland, Ghana, Israel and Mexico. Sanford Health includes 35 hospitals, 140 clinic locations and 1,200 physicians in 70 specialty areas of medicine. With more than 25,000 employees, Sanford Health is the largest employer in North and South Dakota. The system is experiencing dynamic growth and development in conjunction with Denny Sanford’s nearly $700 million in gifts, the largest ever to a health care organization in America. These gifts are making possible the implementation of several initiatives including global children’s clinics, multiple research centers and finding cures for type 1 diabetes and breast cancer. For more information, please visit sanfordhealth.org.